Stripe, a web application allowing merchants to accept credit card payments through their websites was established in 2010. 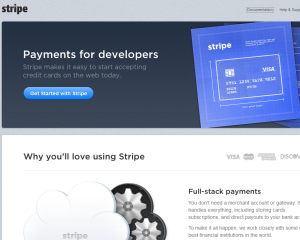 Stripe caters to a particular group of people as they present themselves as ‘payment for developers’. Stripe service is tailor made for web developers who want to use the application according to their preferences. Very similar to Braintree Payment Solutions, Stripe however, differs with no setup fees or monthly fees and monthly minimum charges being applicable, unlike other such services. Curiously, its competitor- PayPal too has an investment capital in Stripe Company. Stripe’s pre transaction fee is 2.9% + $0.30, irrespective of card type or location, which is pretty fair in lieu of costs and fees of other such services. Stripe does not charge any fee for refunds or failed payments but just a Chargeback fee of $15. In short the pricing and business module is quite similar to that of mobile credit card processing company Square, however for online businesses. Despite the plus points, Stripe has a shortcoming in the point that it does not have a dedicated customer phone support number which poses a problem for some merchants. Stripe does have a help section on its website, a community chat feature and an email support system, though. So far, only praises have been showered over this company in its various reviews and no consumer complaints have been located regarding Stripe regarding its customer service level. However, it should be noted that the Better Business Bureau (BBB) does not have a profile for Stripe till date. For someone who intends to incorporate payment processing into their system, Stripe is a considerable tool; if not for all projects but for future projects.